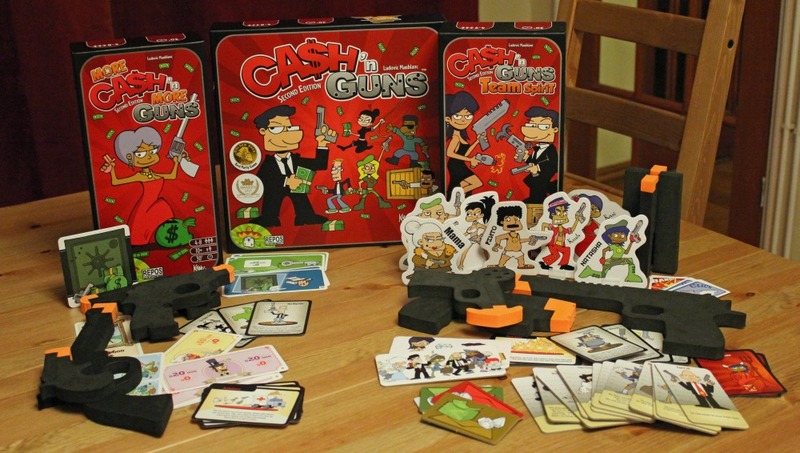 Review: Both of Cash ‘n Guns’ expansions! more rules, more friends, more guns, more cash, less fun? 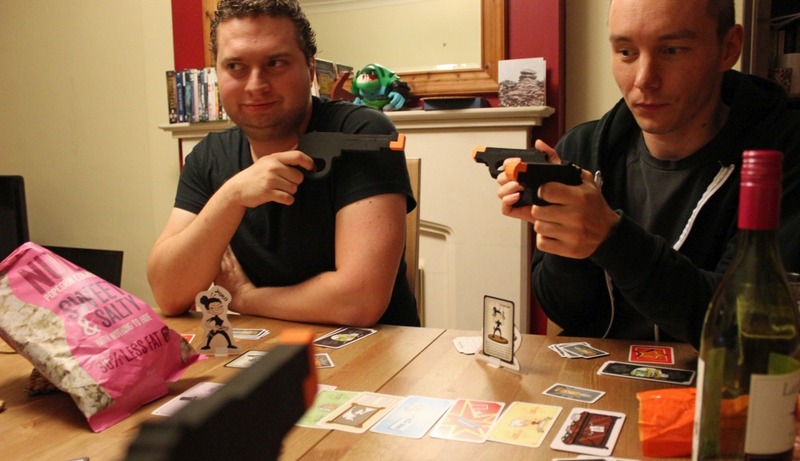 Pip: In order to assess the two Cash ‘n Guns expansions I’ve spent a couple of evenings luring friends to my house with the promise of nachos, homemade chilli and foam guns. One time there was even banana bread. That was the tastiest heist. ANYWAY! I am now in a position to tell you all of my opinions on More Cash ‘n More Guns, and Cash ‘n Guns: Team Spirit. Also I have a terrifying foam arsenal which makes me look like I’ve joined the foamy NRA. And so! Here’s a brief explanation of the base game in case you’re unfamiliar: Cash ‘n Guns is a party game about dividing the loot from a heist. You all play one of the ne’er-do-wells involved in the heist, each armed with a foam weapon, and you’re trying to end up with the most loot. 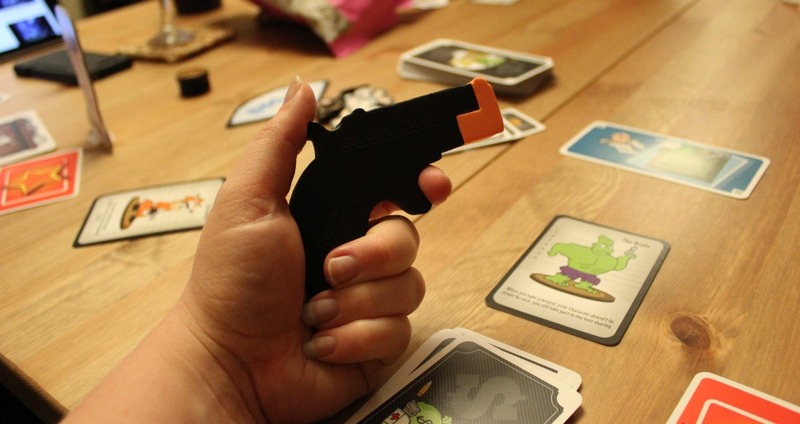 Every round loot cards are dealt onto the table, the players pick a live or fake bullet which they play face down, and then point their foam gun at another player. They then have the choice to duck out of the round, avoiding injury but missing out on loot or staying in and risking injury but also potentially being part of the loot-sharing. There’s also a godfather role which can move around between players and does things like giving that player the ability to tell someone to shoot at someone else. More Cash ‘n More Guns adds a loot safe, four new guns and a bunch of other bits and pieces. The safe puts some of the loot cards outside the remit of the normal loot-sharing process as 16 of those cards are now stored underneath the safe card and can only be accessed via particular actions. 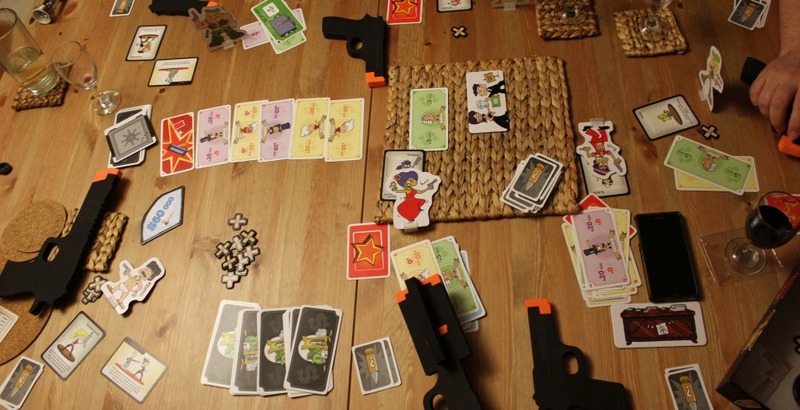 The guns go along with particular power cards and introduce new smatterings of gameplay – for example, there are twin guns where one is the real gun and the other is a fake, so you can point at two people during the holdup stage and they have to try to guess which is the real one. It bestows the power of extra intimidation, essentially. 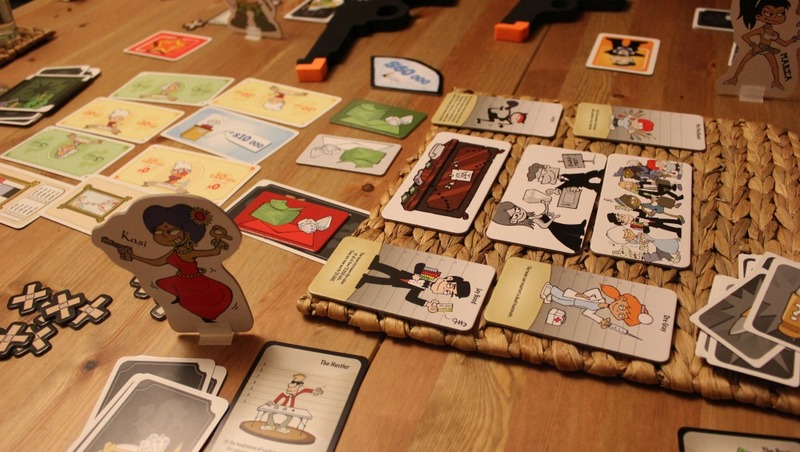 There are also surprise cards which people can use during the game as one-shot abilities – Coup D’Etat lets you take the godfather tile before the current godfather can make anyone change targets, Ambulance removes a wound, Magic Bullet means a live round also wounds the player to your target’s right. 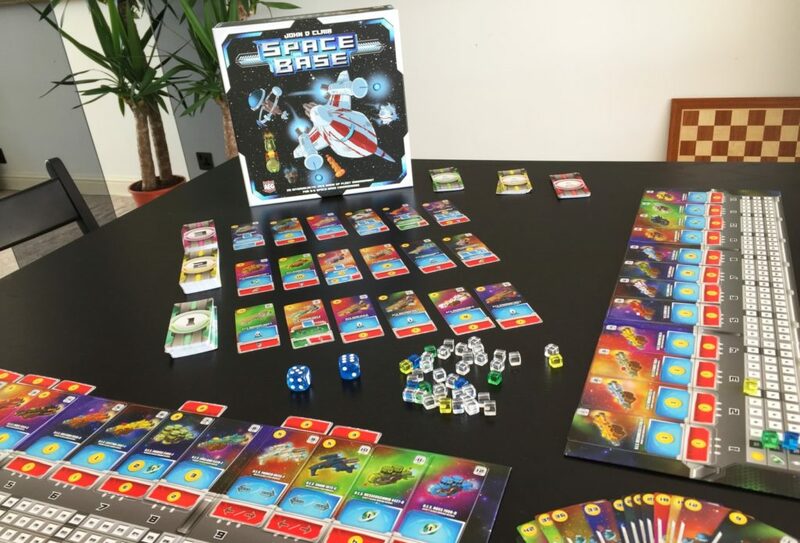 I really liked these because they let you exert a bit more control over the game and give you a bit of wiggle room/extra strategising power! 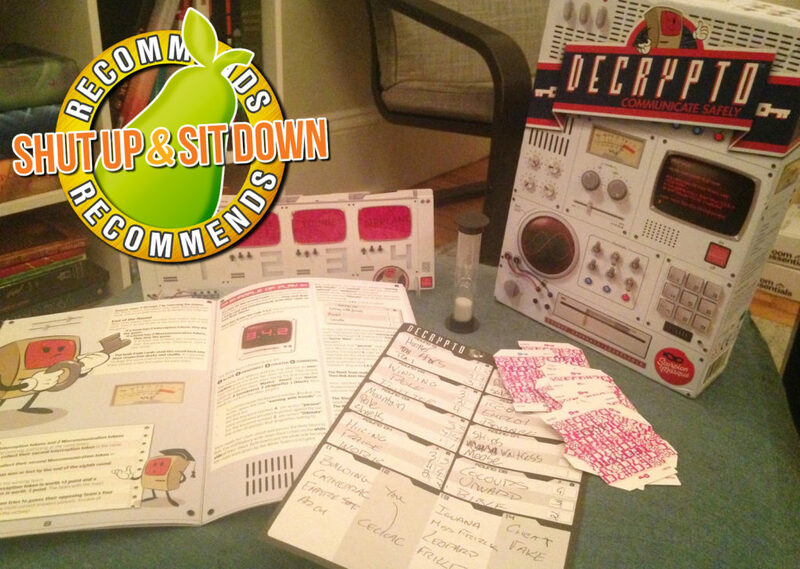 The loot cards either relate to using the safe (seen above, next to the wine botttle), collecting a suitcase and key combo, or they’re fake versions of existing loot. The point here is that the person who has the godfather card at the very end of the game gets to decide whether the fake money is worthless or treated as real money so it can either swell your final score or leave you with a big dent where money should be if you’ve been gambling on that fake cash for a win. That normal/worthless decision only applies to the fake cash. The fake painting and the fake diamonds work differently. I was about to start explaining those here, but it’s probably better to talk about the fact that so much explanation is actually necessary. 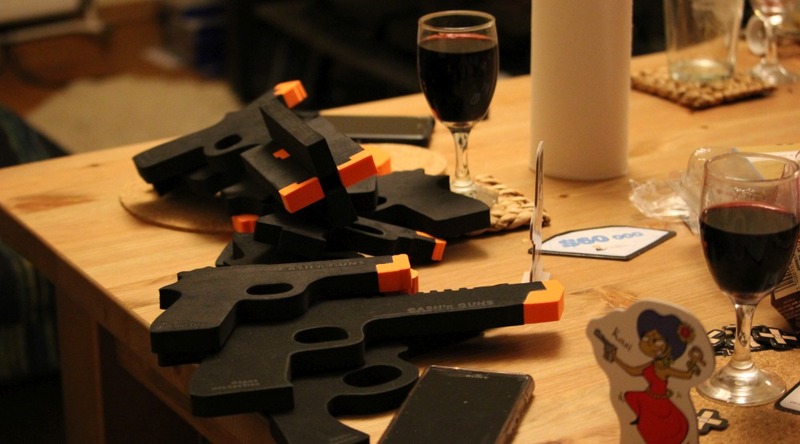 Thing is, with a party-style game, you want – at some point – to stop having to explain and start to play. But the appearance in this expansion of the safe, the sort-of unrelated key and suitcase collection minigame, the fact that some of the cash becomes real or not real, but the fake painting can be changed to a real painting if you pay money at the end and that the fake diamonds never count as money but they do count as two diamonds, and then all the new guns… it’s a lot for a new player to take in and some of it fits the cheery heist mood and other bits just feel like adding complexity or gaminess that’s disproportionate to the pay-off. 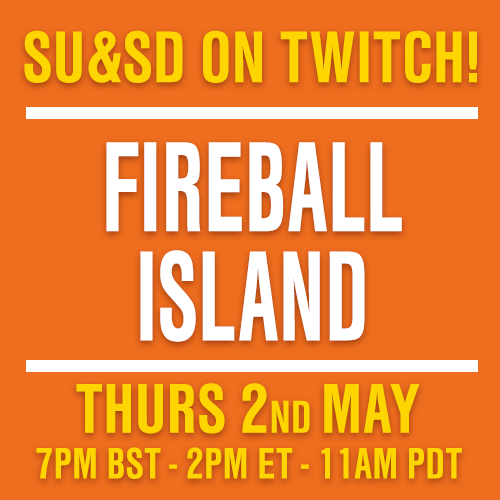 I think it will suit people who aren’t looking to change the fundamentally every-player-for-themselves nature of the base gameplay but are part of a group who have played it so much they’re looking to add that complexity to shake things up a bit and reinvigorate their games. I also really like the addition of the surprise one-shot ability cards. Just maybe keep in mind that if you have a newbie you should only start in on the wine after you’ve let the mechanical explanations sink in! (We enjoyed a fine port for part of the evening then slid into whisky or chocolate wine according to personal preference). Team Spirit was far more my kind of expansion. I’ll level with you – I know that lots of people really love Cash ‘n Guns but for me the base game frequently falls flat. I’m not after grand strategy or anything, but I need a bit more guaranteed traction in the form of a basic strategy or a vague plan to start investing in the game, otherwise it gets a bit inconsequential and I find myself in a really low-stakes heist situation where it’s more about the loot division of the banana bread. I’ve definitely had cool moments, or pulled off smart plays, but they seem too reliant on card draw or other unreliable factors, you know? HOWEVER! Team Spirit has you join up with other heisters to form little factions within the group, working together to try to end the game with the most loot as a pair or a trio. It helps mitigate the random elements as you have options to heal or re-arm one another as well as the ability to skip a loot draw at the end of the round in order to swap one of your cards for a teammate’s card. It doesn’t make the game a lot heavier, or anything, but for me it really helps with the “party” bit of the party game idea because you’re interacting with at least one other person. I’ll give you an example. My partner Chris and our friend Matt were on the same team. Matt had one of the guns that Team Spirit adds – the silencer. You attach a foam silencer to the end of your regular gun and the five blank bullets are treated as live whereas the live ones are treated as duds. Chris had a regular gun so pre-game they’d made a plan that each of them would be shooting their own version of live bullets at the start of the game (Chris shooting his three normal bullets while Matt got rid of three blanks he could treat as live). Matt also used a clip card which is included in the base game loot to fish a regular live bullet out of the discard pile and swap it in for one of his blanks. When Chris had got rid of all his live bullets they used a turn of the loot phase to swap their power cards, leaving Chris with the silencer and converting all off his remaining blanks to live rounds while Matt’s live rounds which had been thus far treated as blanks reverted to live rounds. Something I will say at this point, though, before I talk about other bits the expansion adds, is that the box information is slightly misleading. It says the expansion is for 4-9 players and it sort of is in that you can add the new guns and things to the base game which is for 4 or more players, but to do the team stuff that comprises the majority of the expansion you need 6-9 players and I really, really don’t think the box makes that clear enough in any way. Right. Back to the game. The setup is similar to the base game, except you pick your characters from a particular faction so people can easily tell who is working with whom. When playing you can’t aim at a teammate and during the loot phase if you pick up a clip card or a med kit card you can use that on a teammate instead of yourself. There’s also that shadow trading card I mentioned earlier – it’s the thing which let Matt and Chris trade powers – and you can use it to swap a power, loot, ammo or surprise card, even if the teammate is dead. Oh, and with 7 players one team will have more players so there’s an Evil Twin mechanic. All that does is stop that team having an unfair loot advantage by tweaking the looting phase for that team. At the end you tot up your loot as normal and then add scores together to get the team score. I feel like adding this one to the base game is so much easier to introduce to people, plus you can play a normal game with the cards from this expansion without needing to explain forgeries and fake money and safes and all that razzmatazz. It’s just the new guns, and then you can put people in teams when they’re comfy. You deal four mercenary tiles face up at the start of the game so people can see what bonuses are up for grabs. One is Dre Gray who can resurrect a dead teammate (useful if their loot will make the difference between winning and losing), another is Agent 48 who wounds a player of the team’s choice (useful for dealing a death blow to an opponent), Fake Elvis who weds two people on that team so their loot is counted as one person’s (useful for boosting the diamond or painting collection end-of-game bonuses) – you get the idea. Then it’s a matter of once per loot phase having the option for someone to pay into their team’s mercenary pot. Any team who pays into their own pot is guaranteed a mercenary at the end of the game, but paying in the most means your team picks their mercenary first. 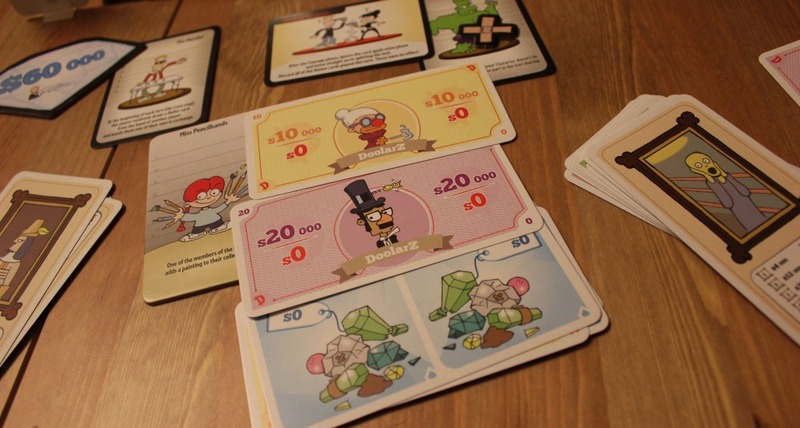 Essentially it’s a minigame where you can spend some of your in-hand wealth to try for a boost at the end of the game. 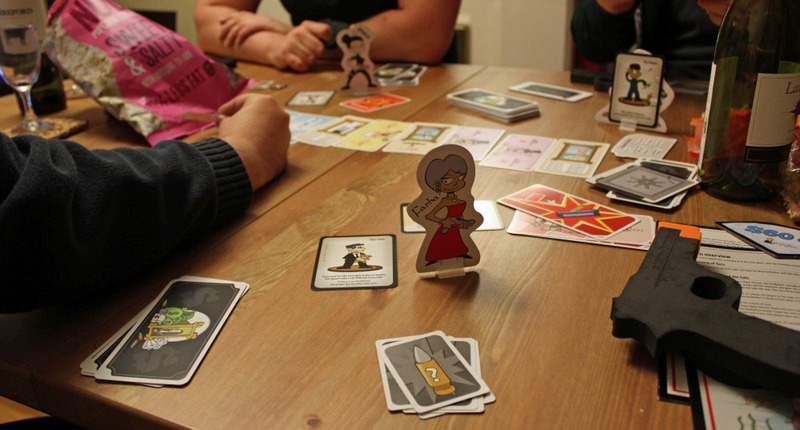 I really like the mercenaries for the same reason I prefer Team Spirit – it’s because it helps mitigate that feeling of being at the mercy of the card draw or of playing a party game solo. I should also point out, though, that three of the mercenaries require the More Cash ‘n More Guns expansion so you can use them if you’ve got that or leave them to one side. Chris and I were talking after the latest heist evening as we tried to stave off a chilli and port coma and he was saying that More Cash ‘n More Guns feels like the opposite to, say, Werewolf, where new characters can just be slotted in as the group expands without complicating the process too much. I’d agree with that. I think it would work for people who have exhausted the base game and want more of that but with extra options. But it felt far harder to introduce to a new player or a new group because it adds so many elements to be explained one by one. Team Spirit is a far easier sell on that front, but to make the most of it you need at least six players, otherwise all you’ll be able to use are the new guns and maaaaaybe the three new surprise cards. It really opened up the game for me as a fun thing when we had a bigger group, though. 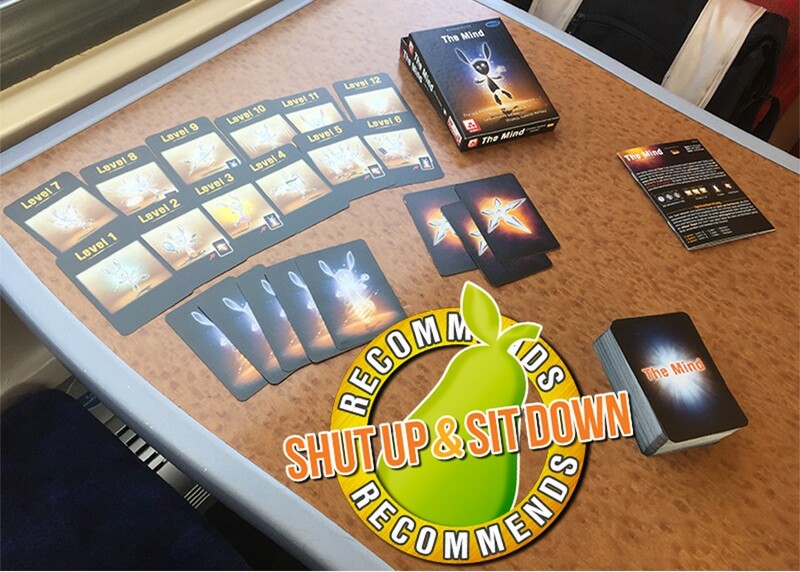 It made it feel a lot more true to the “party” bit of being a party game as well as introducing a small but disproportionately enjoyable layer of casual strategising. It’s also far easier to switch between team/individual modes and add or remove the mercenaries according to personal preference than it is to remove elements of More Cash ‘n More Guns to simplify things for newcomers. I’m now trying to work out how I want to rejig Cash ‘n Guns so I have all the bits I think my friends and I will enjoy the most. It currently looks like this: there’s everything from the base game, then the surprise cards, the new guns and just the fake money from the More expansion (I’d either just deal a couple of extra loot rounds to play that in, or keep ten cards back after shuffling and dealing the eight rounds of eight loot cards you have in a normal game to account for jettisoning the storage space the safe provides), then everything from the Team Spirit expansion except the few mercenary cards which relate to the removed bits of the More Cash ‘n More Guns expansion. In conclusion: if you like teamwork and find the base game a bit lacking in strategic bite, invest in chilli and banana bread and prioritise the Team Spirit expansion. 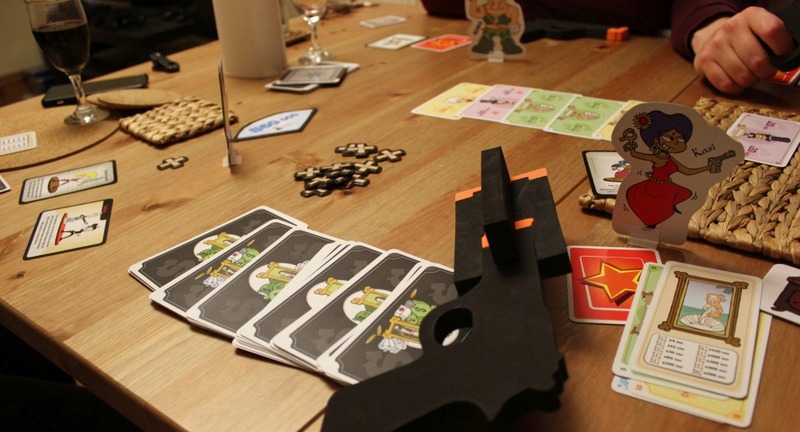 If you love the base game and want to reinvigorate that without needing to talk to anyone else, you’ll want More Cash ‘n More Guns. Now here is how to make a banana loaf which has never failed me.